expanded – Proxies-free.com: 100% Free Daily Proxy Lists Every Day! I'm working on a SharePoint site where I need to show members of the team on a page. 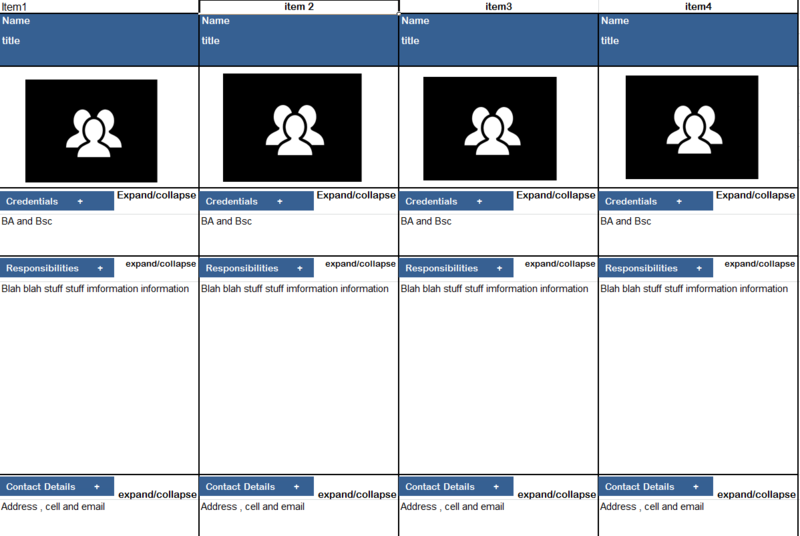 I'd like to be able to see all the team members (each one of them has an entry in my list of members), but I want to be able to expand and collapse some of the columns (see attached sample image) so my page is not cluttered like You can accomplish this using Sharepoint 2013 (The columns I have in my list contain the names of image fields and the contact information). The development of native mobile apps is accomplished through specific programming languages ​​such as Java for An ♪♪♪♪♪ and Objective-C for iOS. Native mobile apps provide the highest level of reliability and fast performance. Our mobile app development company masters the introduction of native frameworks and technologies. We have expertise in working with the native iOS SDK and its frameworks. The significant part of our development team consists of seniors who have professional skills in the development environments C, Objective-C, C ++, Swift, and XCode. Some of the solutions developed include Apple Watch and Apple TV app development. Our mobile app development team is very creative and we are developing our own iOS open source products. We have an extraordinary evolution of An ♪♪♪♪♪ SDK and An An NDK that goes beyond pure Java programming. We're able to build powerful apps that run on over 15,000 different An An devices. Our specialists can use the most important programming languages ​​such as C ++, Java and Kotlin to create extremely maintainable and performative apps. SCAND's mobile development team has also developed some open source solutions for An developed. Our mobile engineers can develop hybrid apps that are the lines of great code that "wraps" the existing customer's web project and extends its functionality to a variety of mobile devices. Over the last 7 years, we have completed more than 100 mobile hybrid app development projects. Our own cross-platform EPUB SDK became the starting point for the development of EPUB Reader, which in turn was part of EpubCloud. EpubCloud is a service for hosting and sharing EPUB files using the AWS cloud storage. I have a google sheet that I create for billing, and I have 8 variables that are only sometimes used. Each variable has its own line. For example, this load has a scaling fee that is visible in the image I posted (but the other 7 lines are empty in the range of lines 14-21). The data is retrieved from a master sheet, but I want the empty rows to be MINIMUM HEIGHT by default, and ONLY expanded when actually displaying data for a particular variable. Why do I have to do that, you ask? For space reasons for printing, since most settlements have multiple loading operations. I would prefer not having fully expanded 8 lines of BLANK SPACE for each load to save paper and other aesthetic purposes. Any ideas? Thanks for your time! I'm building a line chart that I'd like to change when a new record comes from an API. Not only the values ​​(Y-axis) change, but also the date range (X-axis) that is currently displayed. The problem is (for me), as the period grows, parts of the line on the left take longer to get there, as they are on the right (because they need to travel further to get the required space of new data and, as a result, the line overlaps when it changes to the left. Is that even a UX "bug" or is it just annoying me? If so, is there a canonical way to solve it? I like the way the transitions on the axes and on the line look like (if they do not do their overlap thing). Maybe I should just animate the axes and show / hide the graph when data arrives. However, this can be an overwhelming number of animations, especially considering that below is a pie chart whose slices are also changed with the arrival of new data. The following CodeSandbox randomly generates some dummy data, so you probably need to click on it To update Button several times to see the effect. NAME = "Red Hat Enterprise Linux Server"
PRETTY_NAME = "Red Hat Enterprise Linux"
CPE_NAME = "cpe: / o: redhat: enterprise_linux: 7.6: GA: Server"
REDHAT_BUGZILLA_PRODUCT = "Red Hat Enterprise Linux 7"
REDHAT_SUPPORT_PRODUCT = "Red Hat Enterprise Linux"
I have the vbox session log file, but I did not insert it here because it is huge. Can share if someone is interested.